Doesn’t it feel good to help others in need? Inspiring senior Yolanda Tagliaferri thinks so. The 92-year-old from North Babylon, New York, affectionately known as “Bunny,” has been lending a helping hand to her fellow seniors for over 30 years, and now, she’s being recognized in a big way. Tagliaferri was recently named District 17 Senior Citizen of the Year by Suffolk County Legislator Lou D’Amaro, according to the Deer Park – North Babylon Patch. Tagliaferri has been involved with the Spangle Drive Senior Center since 1988, when she was elected secretary. Her dedication to the community got her elected as president only a short time after, and she still holds that position today. Aside from the duties that come with being president of the senior center, Tagliaferri also dedicates a lot of time to just making residents’ retirement lifestyles higher quality. In her spare time, she frequently visits the retirement community and often drives residents to doctors’ appointments. She also brings them food, picks up medications and serves as a role model for the entire community. Tagliaferri has inspired older adults and younger generations alike, not only by committing her time to helping others but also by spending time with seniors specifically. Seniors socializing with seniors is beneficial for everyone. Not only do residents at the community receive transportation services and mentoring when necessary, but Tagliaferri and the other seniors experience the mental advantages of staying social and active. A study published in the American Journal of Public Health reported that older women who maintained larger social circles reduced their risk of dementia. They also delayed or prevented cognitive impairment. Additionally, being able to rely on friends for help and confide private matters further enhances these advantages. It’s easy to stay social and maintain a network of friends when living in an active retirement community. 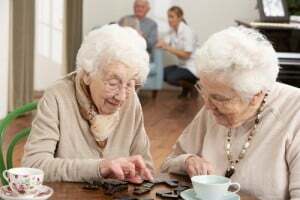 Between engaging in organized group activities and simply living within the same community, many older adults find that socializing is just part of a normal day’s routine. So, whether you dedicate your time to helping seniors, just like Tagliaferri, or you enjoy simply being in the presence of others, you can experience a more fulfilling and healthy retirement lifestyle.